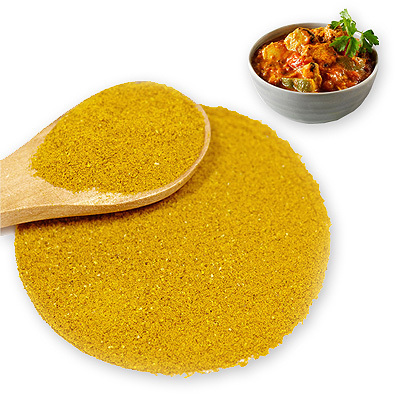 Curry powder is a British invention to imitate the flavor of Indian cooking with minimal effort. Some curry powders, or so the books tell, indeed contain curry leaves, but probably only for historic or linguistic reasons, since dried curry leaves lose their fragrance within days. A typical curry powder should derive its taste mainly from roasted cumin, roasted coriander, black pepper, chilis and roasted fenugeek. Additionally, ginger, lentil flour, salt and sweet spices (cinnamon, cloves and cardamom) are frequently added. The yellow colour stems from turmeric. Spices with no tradition in India (e.g., galangale, caraway, allspice, celery or zedoary) are unreasonable and should not appear in anything that claims an Indian origin, though they are sometimes listed as ingredients in curry powder. But since curry powder is not a traditional recipe, anyone is free to sell his own creation.